How well do you understand God? Do you see Him as mean, cruel and distant … or do you see Him as kind, loving, compassionate and approachable? The sad truth is that the majority of people have a warped view of God because they have never truly seen His heart. 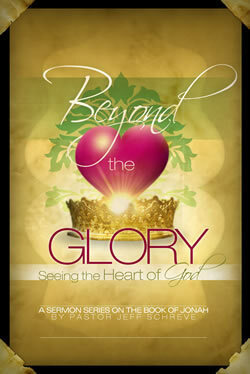 In this revealing 4-MESSAGE series based on the book of Jonah, Pastor Jeff Schreve helps you see beyond the glory and into the very heart of God. If you know God's heart, life will come alive with hope and blessing. THE MESSAGES IN THIS SERIES ARE LISTED BELOW IN THE RELATED PRODUCTS SECTION.